Wyatt Worthington II doesn’t just want to make birdies, he wants to make history. Worthington did both Tuesday, shooting another 2-under 70 to win Event No. 1 of the PGA Tournament Series by two shots at PGA Golf Club. 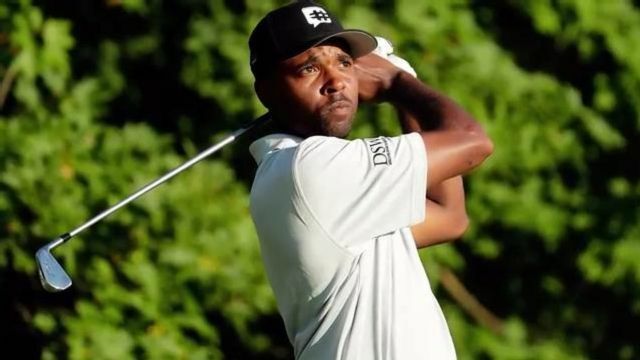 The 29-year-old Worthington is believed to be the first African American to win a PGA Tournament Series event. Earlier this year, he became the second African American club professional to qualify for the PGA Championship. Worthington was 3-under through 12 holes on the Wanamaker Course before his only blemish, a bogey on the par-5 13th. He closed with five pars to win by two shots over four players. Worthington, who teaches in the winter at famed Seminole Golf Club and works at the Golf Depot at Central Park in Gahanna, Ohio, earned $5,000 for the victory. Nick Beddow of Shirley, N.Y. shot the low round of the tournament, a 5-under 67, to share second place with Zac Oakley (71) of Palm City, Fla., Rod Perry (70) of Port Orange, Fla., and Jeff Sorenson (70) of Blaine, Minn. Beddow had a 5-under 31 on the front nine. The conditions weren’t as difficult as Monday’s first round, when nobody in the 69-player field broke 70. The last four months have been somewhat of a blur for Worthington, who gained national attention when he qualified for the PGA Championship at Baltusrol by finishing fifth in the PGA Professional Championship. Tom Woodard in 1991 was the first African American club professional to qualify for the PGA Championship. “It’s definitely been a whirlwind,” Worthington said. “I didn’t think little ol’ me from Reynoldsburg, Ohio would be playing in a PGA Championship and have that type of impact on the culture of the industry. The PGA Tournament Series, which consists of six events, is presented by Golf Advisor. Event No. 2 is Thursday and Friday.